A cell wall is a structural layer surrounding some types of cells, just outside the cell membrane. It can be tough, flexible, and sometimes rigid. It provides the cell with both structural support and protection, and also acts as a filtering mechanism. Cell walls are present in most prokaryotes (except mycoplasma bacteria), in algae, plants and fungi but rarely in other eukaryotes including animals. A major function is to act as pressure vessels, preventing over-expansion of the cell when water enters. The composition of cell walls varies between species and may depend on cell type and developmental stage. The primary cell wall of land plants is composed of the polysaccharides cellulose, hemicelluloses and pectin. Often, other polymers such as lignin, suberin or cutin are anchored to or embedded in plant cell walls. Algae possess cell walls made of glycoproteins and polysaccharides such as carrageenan and agar that are absent from land plants. 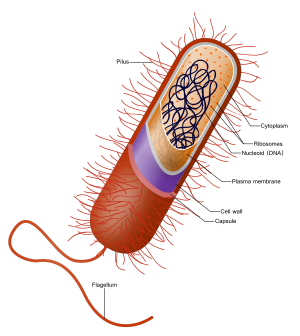 In bacteria, the cell wall is composed of peptidoglycan. The cell walls of archaea have various compositions, and may be formed of glycoprotein S-layers, pseudopeptidoglycan, or polysaccharides. Fungi possess cell walls made of the N-acetylglucosamine polymer chitin. Unusually, diatoms have a cell wall composed of biogenic silica. The primary cell wall of most plant cells is freely permeable to small molecules including small proteins, with size exclusion estimated to be 30-60 kDa. The pH is an important factor governing the transport of molecules through cell walls. Cell walls evolved independently in many groups, including within the photosynthetic eukaryotes. In these lineages, the cell wall is closely related to the evolution of multicellularity, terrestrialization and vascularization. In the primary (growing) plant cell wall, the major carbohydrates are cellulose, hemicellulose and pectin. The cellulose microfibrils are linked via hemicellulosic tethers to form the cellulose-hemicellulose network, which is embedded in the pectin matrix. The most common hemicellulose in the primary cell wall is xyloglucan. In grass cell walls, xyloglucan and pectin are reduced in abundance and partially replaced by glucuronarabinoxylan, another type of hemicellulose. Primary cell walls characteristically extend (grow) by a mechanism called acid growth, mediated by expansins, extracellular proteins activated by acidic conditions that modify the hydrogen bonds between pectin and cellulose. This functions to increase cell wall extensibility. The outer part of the primary cell wall of the plant epidermis is usually impregnated with cutin and wax, forming a permeability barrier known as the plant cuticle. The middle lamella is laid down first, formed from the cell plate during cytokinesis, and the primary cell wall is then deposited inside the middle lamella. [clarification needed] The actual structure of the cell wall is not clearly defined and several models exist - the covalently linked cross model, the tether model, the diffuse layer model and the stratified layer model. However, the primary cell wall, can be defined as composed of cellulose microfibrils aligned at all angles. Cellulose microfibrils are produced at the plasma membrane by the cellulose synthase complex, which is proposed to be made of a hexameric rosette that contains three cellulose synthase catalytic subunits for each of the six units. Microfibrils are held together by hydrogen bonds to provide a high tensile strength. The cells are held together and share the gelatinous membrane called the middle lamella, which contains magnesium and calcium pectates (salts of pectic acid). Cells interact though plasmodesmata, which are inter-connecting channels of cytoplasm that connect to the protoplasts of adjacent cells across the cell wall. The group of algae known as the diatoms synthesize their cell walls (also known as frustules or valves) from silicic acid. Significantly, relative to the organic cell walls produced by other groups, silica frustules require less energy to synthesize (approximately 8%), potentially a major saving on the overall cell energy budget and possibly an explanation for higher growth rates in diatoms. The dictyostelids are another group formerly classified among the fungi. They are slime molds that feed as unicellular amoebae, but aggregate into a reproductive stalk and sporangium under certain conditions. Cells of the reproductive stalk, as well as the spores formed at the apex, possess a cellulose wall. The spore wall has three layers, the middle one composed primarily of cellulose, while the innermost is sensitive to cellulase and pronase. Although not truly unique, the cell walls of Archaea are unusual. Whereas peptidoglycan is a standard component of all bacterial cell walls, all archaeal cell walls lack peptidoglycan, though some methanogens have a cell wall made of a similar polymer called pseudopeptidoglycan. There are four types of cell wall currently known among the Archaea. An extracellular matrix (ECM) is also present in metazoans. Its composition varies between cells, but collagens are the most abundant protein in the ECM. ^ a b Romaniuk, Joseph A. H.; Cegelski, Lynette (14 September 2015). "Bacterial cell wall composition and the influence of antibiotics by cell-wall and whole-cell NMR". Philosophical Transactions of the Royal Society B: Biological Sciences. 370 (1679): 20150024. doi:10.1098/rstb.2015.0024. ISSN 0962-8436. PMC 4632600. PMID 26370936. ^ Rutledge, Ryan D.; Wright, David W. (2013). "Biomineralization: Peptide-Mediated Synthesis of Materials". In Lukehart, C.M. ; Scott, R.A. (eds.). Nanomaterials: Inorganic and Bioinorganic Perspectives. EIC Books. Wiley. ISBN 978-1-118-62522-4. Retrieved 2016-03-14. ^ Hooke, R. 1665. Micrographia: or, Some physiological descriptions of minute bodies made by magnifying glasses. London: J. Martyn and J. Allestry, 1st ed., . ^ Sattelmacher, B (2000). "The apoplast and its significance for plant mineral nutrition". New Phytologist. 149 (2): 167–192. doi:10.1046/j.1469-8137.2001.00034.x. ^ Kalenderblatt Dezember 2013 – Mathematisch-Naturwissenschaftliche Fakultät – Universität Rostock. Mathnat.uni-rostock.de (2013-11-28). Retrieved on 2015-10-15. ^ Link, [D.] H. F. 1807. Grundlehren der Anatomie und Physiologie der Pflanzen. Göttingen (Danckwerts), . ^ Baker, J. R. 1952. The cell-theory: a restatement, history, and critique. Part III. The cell as a morphological unit. Quart. J. Microscop. Sci. 93: 157-190, . ^ Sharp, L. W. (1921). Introduction To Cytology. New York: McGraw Hill, p. 25. ^ Münch, E (1930). Die Stoffbewegungen in der Pflanze. Verlag von Gustav Fischer, Jena. ^ Roberts, K (1989). "The plant extracellular matrix". Curr. Opin. Cell Biol. 1 (5): 1020–1027. doi:10.1016/0955-0674(89)90074-4. ^ Sattelmacher (2000), p. 168. ^ Evert, R. F. 2006. Esau's Plant Anatomy: Meristems, Cells, and Tissues of the Plant Body: Their Structure, Function, and Development. 3rd.ed. John Wiley & Sons, Inc: Hoboken, New.Jersey, p. 65-66, . ^ a b c d Howland, John L. (2000). The Surprising Archaea: Discovering Another Domain of Life. Oxford: Oxford University Press. pp. 69–71. ISBN 978-0-19-511183-5. ^ "Cell Wall and Cell Membrane- Structure, Functions and Differences". byjus.com. Retrieved 2019-02-01. ^ Popper, Zoe A.; Michel, Gurvan; Hervé, Cecile; Domozych, David S.; Willats, William G.T. ; Tuohy, Maria G.; Kloareg, Bernard; Stengel, Dagmar B. (2011). "Evolution and diversity of plant cell walls: from algae to flowering plants" (PDF). Annual Review of Plant Biology. 62: 567–590. doi:10.1146/annurev-arplant-042110-103809. hdl:10379/6762. PMID 21351878. ^ Campbell, Neil A.; Reece, Jane B.; Urry, Lisa A.; Cain, Michael L.; Wasserman, Steven A.; Minorsky, Peter V.; Jackson, Robert B. (2008). Biology (8th ed.). p. 118. ISBN 978-0-8053-6844-4. ^ Buchanan; Gruissem, Jones (2000). Biochemistry & molecular biology of plants (1st ed.). American society of plant physiology. ISBN 978-0-943088-39-6. ^ Fry, Stephen C. (1989). "The Structure and Functions of Xyloglucan". Journal of Experimental Botany. 40 (1): 1–11. doi:10.1093/jxb/40.1.1. ^ Braidwood, Luke; Breuer, Christian; Sugimoto, Keiko (2013-08-29). "My body is a cage: mechanisms and modulation of plant cell growth". New Phytologist. 201 (2): 388–402. doi:10.1111/nph.12473. ISSN 0028-646X. PMID 24033322. ^ Laurence Moire; Alain Schmutz; Antony Buchala; Bin Yan; Ruth E. the; Ulrich Ryser (1999). "Glycerol Is a Suberin Monomer. New Experimental Evidence for an Old Hypothesis". Plant Physiol. 119 (3): 1137–1146. doi:10.1104/pp.119.3.1137. PMC 32096. PMID 10069853. ^ Reid, J. Carbohydrate metabolism:structural carbohydrates. In: P. M. Dey, J. B. Harborne (eds) Plant Biochemistry, Academic Press, 1997, p. 205-236, ISBN 0122146743. ^ Jarvis, Michael C. (2013-12-01). "Cellulose Biosynthesis: Counting the Chains". Plant Physiology. 163 (4): 1485–1486. doi:10.1104/pp.113.231092. PMC 3850196. PMID 24296786. ^ Campbell, Neil A.; Reece, Jane B.; Urry, Lisa A.; Cain, Michael L.; Wasserman, Steven A.; Minorsky, Peter V.; Jackson, Robert B. (2008). Biology (8th ed.). p. 119. ISBN 978-0-8053-6844-4. ^ Abeysekera, R.M. ; Willison, J.H.M. (1987). "A spiral helicoid in a plant cell wall". Cell Biology International Reports. 11 (2): 75–79. doi:10.1016/0309-1651(87)90106-8. ^ Hudler, George W. (1998). Magical Mushrooms, Mischievous Molds. Princeton, NJ: Princeton University Press, 7. ISBN 0-691-02873-7. ^ Webster, John & Weber, Roland W.S. (2007) "Introduction to Fungi" New York, NY: Cambridge University Press, 6." ^ a b c d Webster, John & Weber, Roland W.S. (2007) "Introduction to Fungi" New York, NY: Cambridge University Press, 5-7." ^ Sendbusch, Peter V. (2003-07-31). "Cell Walls of Algae Archived November 28, 2005, at the Wayback Machine". Botany Online. Retrieved on 2007-10-29. ^ Raven, J. A. (1983). "The transport and function of silicon in plants". Biol. Rev. 58 (2): 179–207. doi:10.1111/j.1469-185X.1983.tb00385.x. ^ Furnas, M. J. (1990). "In situ growth rates of marine phytoplankton : Approaches to measurement, community and species growth rates". J. Plankton Res. 12 (6): 1117–1151. doi:10.1093/plankt/12.6.1117. ^ Koivikko, Riitta; Loponen, Jyrki; Honkanen, Tuija; Jormalainen, Veijo (2005). "Contents of soluble, cell-wall-bound and exuded phlorotannins in the brown alga Fucus vesiculosus, with implications on their ecological functions" (PDF). Journal of Chemical Ecology. 31 (1): 195–212. CiteSeerX 10.1.1.320.5895. doi:10.1007/s10886-005-0984-2. PMID 15839490. ^ Sengbusch, Peter V. (2003-07-31). "Interactions between Plants and Fungi: the Evolution of their Parasitic and Symbiotic Relations Archived December 8, 2006, at the Wayback Machine". biologie.uni-hamburg.de. Retrieved on 2007-10-29. ^ a b Alexopoulos, C. J., C. W. Mims, & M. Blackwell (1996). Introductory Mycology 4. New York: John Wiley & Sons, 687-688. ISBN 0-471-52229-5. ^ a b Raper, Kenneth B. (1984). The Dictyostelids. Princeton, NJ: Princeton University Press, 99-100. ISBN 0-691-08345-2. ^ van Heijenoort J (2001). "Formation of the glycan chains in the synthesis of bacterial peptidoglycan". Glycobiology. 11 (3): 25R–36R. doi:10.1093/glycob/11.3.25R. PMID 11320055. ^ a b Koch A (2003). "Bacterial wall as target for attack: past, present, and future research". Clin Microbiol Rev. 16 (4): 673–87. doi:10.1128/CMR.16.4.673-687.2003. PMC 207114. PMID 14557293. ^ Joseleau-Petit D, Liébart JC, Ayala JA, D'Ari R (September 2007). "Unstable Escherichia coli L forms revisited: growth requires peptidoglycan synthesis". J. Bacteriol. 189 (18): 6512–20. doi:10.1128/JB.00273-07. PMC 2045188. PMID 17586646. ^ Gram, HC (1884). "Über die isolierte Färbung der Schizomyceten in Schnitt- und Trockenpräparaten". Fortschr. Med. 2: 185–189. ^ Hugenholtz P; Rogozin, Igor B; Grishin, Nick V; Tatusov, Roman L; Koonin, Eugene V (2002). "Exploring prokaryotic diversity in the genomic era". Genome Biol. 3 (2): reviews0003.1–reviews0003.8. doi:10.1186/gb-2002-3-2-reviews0003. PMC 139013. PMID 11864374. ^ Walsh F, Amyes S (2004). "Microbiology and drug resistance mechanisms of fully resistant pathogens". Curr Opin Microbiol. 7 (5): 439–44. doi:10.1016/j.mib.2004.08.007. PMID 15451497. ^ a b White, David. (1995) The Physiology and Biochemistry of Prokaryotes, pages 6, 12-21. (Oxford: Oxford University Press). ISBN 0-19-508439-X. ^ Becker, B. The cell surface of flagellates Archived February 12, 2013, at the Wayback Machine. In: The Flagellates. Unity, diversity and evolution. Ed. : Barry S. C. Leadbeater and J. C. Green Taylor and Francis, London 2000. ^ Frantz, Christian; Stewart, Kathleen M.; Weaver, Valerie M. (2010-12-15). "The extracellular matrix at a glance". J Cell Sci. 123 (24): 4195–4200. doi:10.1242/jcs.023820. PMC 2995612. PMID 21123617. ^ Alberts, Bruce (2002). Molecular biology of the cell (4 ed.). New York: Garland. p. 1065. ISBN 978-0-8153-4072-0. Look up cell wall in Wiktionary, the free dictionary.